Crash at "Reading Comets Data"
I'm having a bit of a problem when adding another planet to my newly made system. I am trying to remake LTT 8750 system from Elite Dangerous. 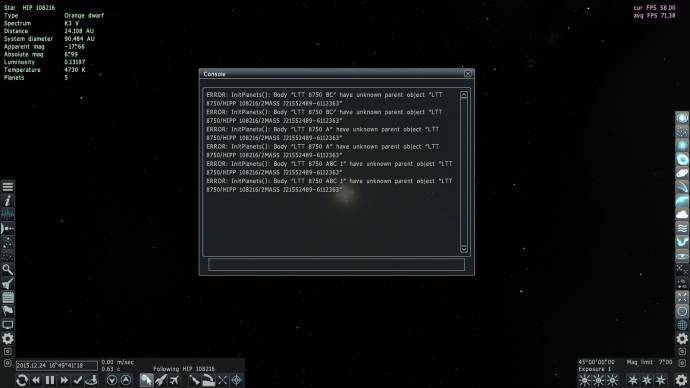 I have the triple star system going, and I have a Gas Giant orbiting the three stars, with a planet around the main star (LTT 8750 A), but when I add another planet the game crashes when loading planets "Reading Comets Data". When checking the log it seems to crash on the system I'm editing. I've commented out Atmosphere, Water and Clouds to see if they were the problem, but still crashes. If I comment out the entire planet, the game launches fine. I have tried adding another planet in the same spot, and the same thing happens. Surely there's not a limit some where. 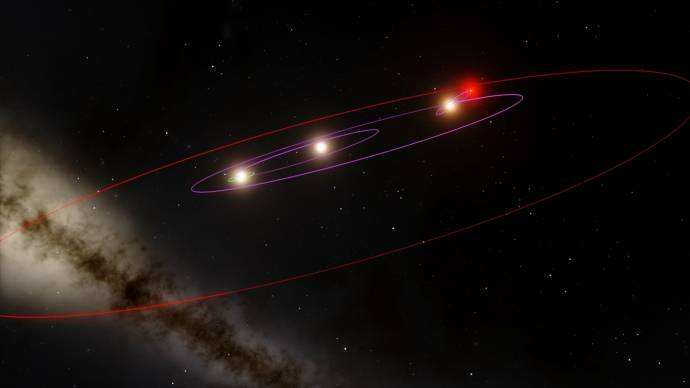 I've seen more than triple star systems have cool looking little systems around them. So what's stopping me from making one? Make sure you didn't link planet to itself (check ParentBody). If you show us the full system script, we can give an answer. Also, there is no reason to create a new thread for such a regular question. Sorry for starting a new thread. I've checked the ParentBody line and it's not linked to itself. Planet name is LTT 8750 A 4, the parentbody is LTT 8750 A.
I've placed the .sc file in this comment. In line 20 of your script, the 'Star' for 'Corona' does not belong there. In addition, should the parameter 'ParenBody' contain only one value, in this case, "Hip 108216"
And you wrote 'hip' with two 'p'. Does this look like you want it? With the Corona line, I was just seeing if adding a corona line would actually change the stars corona. I wanted it to move a little quicker. With the ParentBody, I didn't know we could just put the one value in. I'll change that. And with the HIP part, yeah, a little mistake I must have not noticed. :/ I was taking the name from Elite itself, which has two P's for some reason, even though I did look the system up to see if it had any other name (which it obviously does) and that only included one P, like you said. But that is definitely how I want my system to look, and it works fine, until I add another planet around the main star. Overall, the system is meant to have a total of 8 planets and about 7-9 moons. Still have no idea what was causing the game to crash though. I think the 'Star' in front of 'Corona' is fault, because if I try to start your original script, the 'Star' not removed, SE crashes almost immediately. I added few checks so SE not crashed anymore if such mistakes are made in catalog. Will such errors then displayed in the console?